Jeff Howe’s Nov. 6 special-election victory as senator for District 13 is a momentous tie-breaker for the Minnesota State Senate. Starting in January, Republicans will control the Senate by one vote – 34 to 33. Howe’s election is what made the difference. He will serve the last two years of the four-year term begun by Sen. Michelle Fischbach. After she was named lieutenant governor earlier this year, her exit from the state Senate left that chamber with a tie vote – 33 Republicans, 33 Democrats. Former Sartell Mayor Joe Perske, vying against Howe, lost his bid for a seat in the Minnesota State Legislature. Howe said during his frenetic campaigning in the district, he wore a pair of tennis shoes at times and sometimes a pair of boots. “I had to get the boots re-soled,” he said. District 13 was a Republican sweep Nov. 6. Besides Howe, District 13A Rep. Tim O’Driscoll (R-Sartell) was re-elected to his fifth term, and Lisa Demuth (R-Cold Spring) was elected as District 13A representative. Howe, a Rockville resident, won the election with a vote total of 21,714 (57 percent of the total votes cast). Perske garnered 16,2018 votes. There were 49,244 registered voters in the Senate District 13 election. Four years ago, Perske lost his bid for the 6th District U.S. House seat to Tom Emmer. Emmer was re-elected to that seat in the Nov. 6 election. Howe currently serves as state representative for House District 13A. After Fischbach (R-Paynesville) left that seat to become lieutenant governor, Howe decided to file for the senate seat, and Perske also decided to file. Fischbach, who was a longtime senator for that district, was president of the senate. She became lieutenant governor after Dayton appointed then-lieutenant governor Tina Smith to fill the U.S. Senate seat vacated by Sen. Al Franken after he resigned. Senate District 13 is west of St. Cloud and includes St. Joseph, Sartell, St. Stephen, Cold Spring, Paynesville, Le Sauk Township, Sauk Rapids Township, Precinct 4 of Waite Park, Sauk Rapids, Holdingford and Avon. 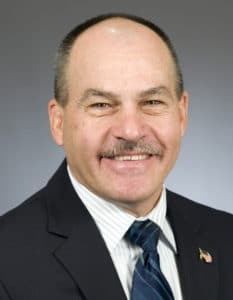 Howe, a longtime National Guard member, said veterans’ issues are his “number-one passion,” and he hopes to keep working hard to make Minnesota a leader in how it treats its veterans. Legislative action to ensure agencies and jurisdictions can share information regarding mental-health issues so crimes can be prevented and people can get the treatment they need before catastrophes happen. Locally, more than $3 million is spent to put people with mental-health issues in jail or in detox units, then they are released after receiving no treatment, Howe said. Recent mass shootings, he said, are not caused by guns but by people who have mental-health issues. “I’m hoping Gov. (Tim) Walz gives commissioners latitude to cross-pollinate agencies so information about people with mental-health issues can be shared,” he said. That way, he added, a multi-disciplinary team can intercede and ensure such people get the help they need. In addition, Howe is in favor of giving incentives, such as scholarships, to people willing to make a career in the mental-health field so there won’t be such a shortage as there is now, particularly at VA hospitals and in rural areas. Howe said both parties must work on a way to bring the state’s tax system into conformity with tax changes that were made at the federal level. Health care is another priority, he said. Howe said he has both hopes and concerns for the next legislative session. Howe was first elected in District 13A in 2012. He owns his own consulting firm and served 35 years in the Minnesota National Guard, including two deployments to Iraq. He retired from the Guard last year with the rank of lieutenant colonel. Howe served on the Rockville City Council and recently retired as a city firefighter after 27 years. He had been at various times fire chief, fire marshal and fire-and-emergency coordinator. Perske, longtime teacher and soccer coach, has been a Sartell City Council member (2005-2010) and was later elected as the city’s mayor (2011-2014). He was elected county commissioner in 2016, a seat he will maintain through his term.